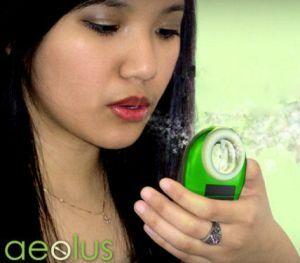 Industrial designer Cyrene Quiamco is the person who designed this interesting cell phone concept called the Aeolus Phone. The phone can be recharged wherever you are because it uses renewable energy. In order to charge the battery, the handset harnesses solar and wind energy. It features a power generating fan that uses wind to produce power and if there is no wind, solar energy powers the phone. The Aeolus has an energy-efficient one-color LCD screen. In addition, according to Quiamco, the phone can be made using renewable materials. You can also easily attach the device to a bicycle. With the help of a tripod you may attach the phone to the window of your car so it would produce more energy when the car is moving.